Careful selection of the right lubricant(s) is required to keep a machine running smoothly. 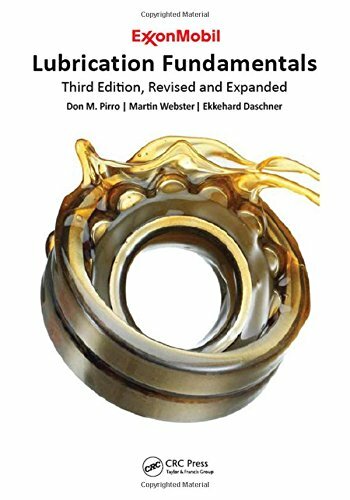 Lubrication Fundamentals, Third Edition, Revised and Expanded describes the need and design for the many specialized oils and greases used to lubricate machine elements and builds on the tribology and lubrication basics discussed in previous editions. Utilizing knowledge from leading experts in the field, the third edition covers new lubrication requirements, crude oil composition and selection, base stock manufacture, lubricant formulation and evaluation, machinery and lubrication fundamentals, and environmental stewardship. The book combines lubrication theory with practical knowledge, and provides many useful illustrations to highlight key industrial, commercial, marine, aviation, and automotive lubricant applications and concepts. All previous edition chapters have been updated to include new technologies, applications, and specifications that have been introduced in the past 15 years. Whether used as a training guide for industry novices, a textbook for students to understand lubrication principles, or a technical reference for experienced lubrication and tribology professionals, Lubrication Fundamentals, Third Edition, Revised and Expanded is a "must read" for maintenance professionals, lubricant formulators and marketers, chemists, and lubrication, surface, chemical, mechanical, and automotive engineers. Don M. Pirro is the global alliance technical manager at ExxonMobil Research and Engineering, Paulsboro, New Jersey. He started his career in 1978 as a test engineer for Ingersoll Rand’s Turbo Compressor Division. He has more than 36 years of lubrication experience with ExxonMobil in various technical positions. He is the author or contributing editor of several scholarly articles on synthetic lubes, environmental awareness applications, grease technology, lubricant interchangeability, used oil analysis, and marine lubricants. He graduated from Rutgers University, New Brunswick, New Jersey, with degrees in mechanical engineering and business administration. Ekkehard Daschner is the industrial lubricant section head and greases technology program lead at ExxonMobil Research and Engineering, Paulsboro, New Jersey. Daschner earned his mechanical engineering degree in Germany and started his career in an aluminum company. In 1982, he joined the Mobil Oil AG R&D laboratory in Germany supporting product development projects. After holding various positions in technical support, he was appointed Area Sales Director and Brand Manager in Germany and the European headquarters in London and Brussels, and later served as European and later as Global Industrial and Marine Equipment Builder Services Manager. Martin Webster is a senior research associate at ExxonMobil Research and Engineering, Annandale, New Jersey. He earned his BS and MS in aeronautical engineering and his PhD in tribology from Imperial College, London, UK. In 1986, he was awarded the Bronze Medal in tribology from the Institute of Mechanical Engineers in the UK. After spending four years working in the UK, he joined ExxonMobil in 1989. At ExxonMobil, Martin has held various positions in research and product development and is currently involved in the study of fundamental lubrication mechanisms at the company’s Corporate Strategic Research Laboratory. "... a key foundation reference which any serious practitioner in our field should have―and read... it could easily fit into the course materials used in some of the new undergraduate programs arising in our universities." "This book is of great value for those working in industries where effective lubrication is a key factor for obtaining solutions with a high reliability. The book gives an excellent description of the lubrication mechanisms and the impact of lubricant selection on performance. The authors have done a great job in compiling lubrication knowledge of so many applications in a single book." "...an intensely practical and thorough reference resource, both for those involved in the practical side of lubricants and lubrication such as designers, lubricant salespersons and service engineers, and also for researchers who should know more about lubricants and lubricated machines. I heartily recommend it." Webster, Martin; Daschner, Ekkehard; Pirro, Don M.